A Trifecta Post for The Carpenter's Gift: A Christmas Tale About the Rockefeller Center Tree. I love celebrating memorable books with fourth-grade teacher Mr. Colby Sharp and the Nerdy Book Club. 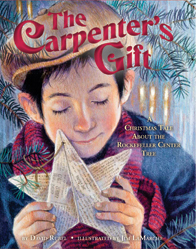 We are the last three stops on David Rubel and Jim LaMarche's blog tour for their poignant picture book, The Carpenter's Gift: A Christmas Tale About the Rockefeller Center Tree. Award-winning illustrator Jim LaMarche takes you behind the scenes of The Carpenter's Gift. Mr. Schu: What planted the seed for The Carpenter’s Gift? David Rubel: The Carpenter’s Gift is actually my second book about Habitat for Humanity. 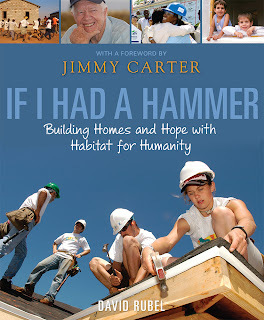 The first was a middle-grade nonfiction work called If I Had a Hammer, which told the stories of the organization, the people who volunteer for it, and the people it serves. When I began writing that book, I knew very little about Habitat, so I had a lot of research to do. As a fan of the late George Plimpton, I’m usually inclined to adopt the role of participant-observer, but in this case I decided not to volunteer for Habitat while writing the book. I was concerned, correctly I still think, that if I volunteered, my experience would influence unconsciously the way I described the experiences of others. But I also decided that, once the book was done, I would volunteer; and I did just that, traveling to Thailand about the time the book was published to take part in the 2009 Jimmy and Rosalynn Carter Work Project. This is the best way I’ve found to describe that experience: Someone can tell you what a rollercoaster ride is like—and many people had indeed told me what to expect at a Carter build—but it’s never the same thing as taking the ride yourself. When I got back from Thailand, exhausted, I knew that I had something more to write about Habitat—something that wouldn’t quite lend itself to nonfiction, because it was a feeling more than an idea. I got back from Thailand just in time for Thanksgiving and spent the next several days dozing on the couch while my kids watched television. One night, they watched the lighting of the Rockefeller Center Christmas tree. I knew already from the research for my first book that Tishman Speyer, the owners of Rockefeller Center, had begun a tradition of donating the tree to Habitat. But that night it occurred to me that the tree could serve as the perfect symbol for the new story that I wanted to tell—one that used giving and receiving at holiday time as a metaphor for the interrelation of people occupying different stations in life. Everything else followed from that point. Mr. Schu: What do you hope readers glean from reading about Henry and the first Rockefeller Center tree? David Rubel: To be truthful, I really want readers to cry. In my other life as a historian, I think a lot about politics and about what motivates people to be politically involved. I’ve read enough to become deeply suspicious of people who reduce the subject to a bundle of policy white papers. Too often, that kind of talk is designed to obscure the underlying issues of right and wrong that such people would rather avoid. We’d all be better off, I think, if we tried to understand events on an emotional, and not simply an intellectual, level. I think that we don’t let ourselves look at the world this way very often, because it’s just too much to process on a day-to-day basis. But there are times, especially around the holidays, when people open up and it’s possible to get by these defenses (children have them, too). At that point, if you touch a reader in the right way, the only reaction that makes any sense is to cry—just the way you do at the end of It’s a Wonderful Life. “O brave new world that has such people in it!” as Miranda cries in The Tempest. Mr. Schu: How and why should people support Habitat for Humanity? David Rubel: What I like best about Habitat for Humanity is that everyone is encouraged to be a participant. Most philanthropies solicit donations to fund the activities of employees who provide services to the needy. Habitat has a different model. It accepts donations, of course, but it also organizes volunteers to work directly with people in need. A long time ago, the founders of Habitat figured out that the single greatest cost in building a house was the labor. If most of that could be provided by volunteers, simple, decent houses could be built very affordably. So that’s what Habitat does. It raises money to pay for the building supplies, recruits volunteers to help with the labor, and works with partner families to build simple, decent, affordable homes. The partner families repay the building costs through no-profit mortgages, and Habitat uses the monthly payments to fund even more construction. Braveheart screenwriter Randall Wallace calls it “a perpetual-motion miracle,” and he’s right. But there’s one other aspect to working with Habitat that most people don’t realize until they’ve volunteered themselves. 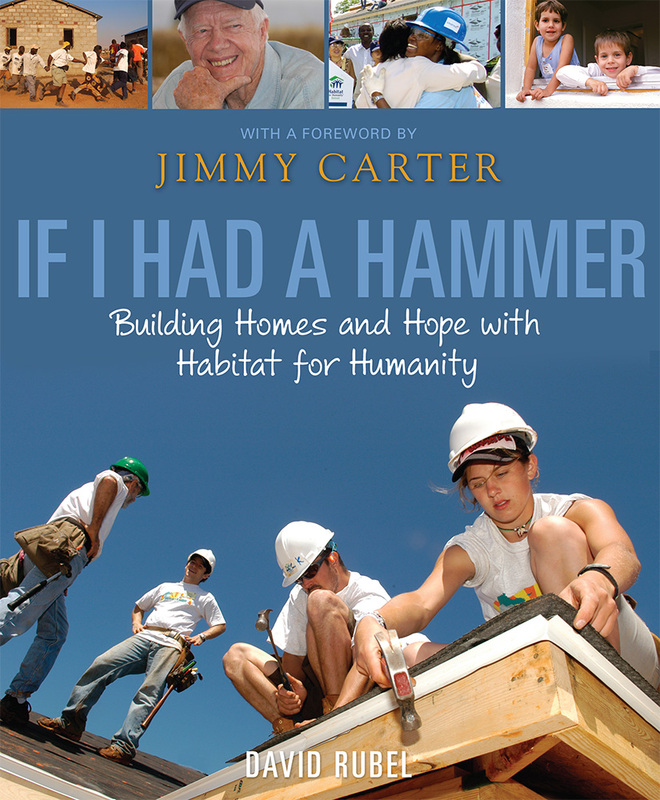 As Habitat’s most famous volunteer, former president Jimmy Carter, likes to say, the work is “redeeming.” I got to spend some time with President Carter while working on If I Had a Hammer, and he explained to me why he supports the organization. The gap between the haves and have-nots, the president said, is so wide that no single person can cross it by himself. The differences in experience are just too great for the people on one side of the divide to communicate effectively with people on the other side. But an organization like Habitat can act as a bridge, bringing people together. Once you’ve experienced this feeling, you just can’t get enough. Mr. Schu: Please recommend books or resources for young readers who want to learn more about the Christmas tree at Rockefeller Center, Habitat for Humanity, Jimmy Carter, and holiday traditions. There is also a great deal of Carpenter’s Gift–related content on the habitat.org web site, including instructions on how to fold the newspaper star that Jim LaMarche illustrates on the cover. Click here to download this activity sheet. I am giving away one copy of The Carpenter's Gift. 1. It will run from 11/28 to 11:59 p.m. on 12/1. 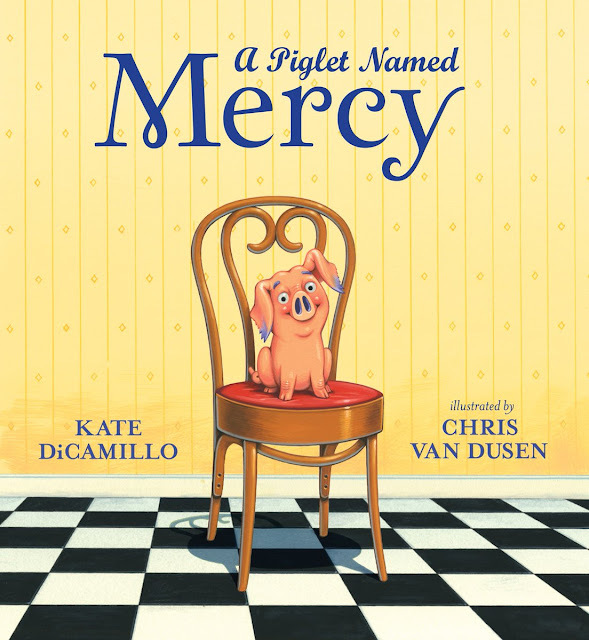 Please visit Colby Sharp's blog to read his interview with illustrator Jim LaMarche. David Rubel wrote a nerdy essay for the Nerdy Book Club. What Book Are You Most Thankful For This Year?